It’s leading up to summer, the perfect time to get away for a camping trip. Whether you are travelling solo, with a few mates or gathering the whole family there are a few things you need to keep in mind. 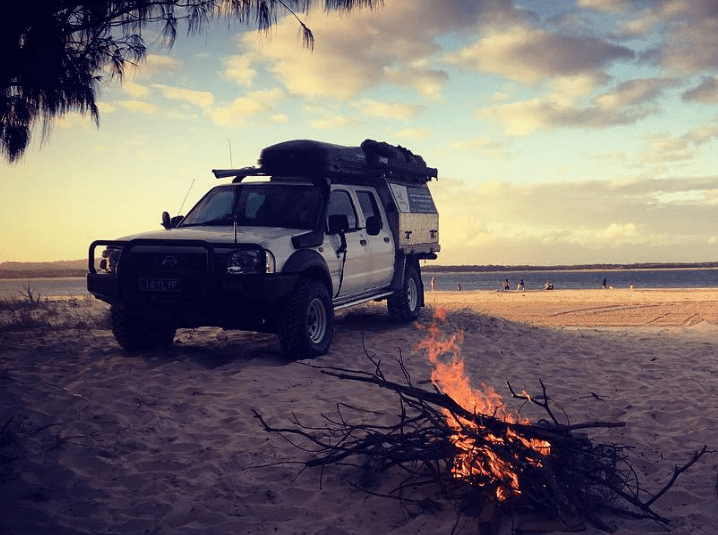 At Mates Rates Tools we love to get out and put our canopies and toolboxes to the test, one of the best ways to do so is hit the road for a camping trip. From Perth to Sydney and everywhere in between, we have put our products to the test in varying conditions. We have put together this list of handy tips from our experience over the years. Getting out of town for a decent period can involve a substantial amount of gear. With any luck, you’ll have a decent sized ute or 4wd with plenty of utility in the way of toolboxes and canopy space to load everything up. But effectively packing your camping equipment, tools and other gear is somewhat of an art. Here are some handy tips you may find useful. It makes sense to minimise your load before you start packing. Don’t include more things ‘just in case’. The lighter the load, the less the strain on the vehicle and that means better fuel economy, less chance of breakdowns, flat or blown tyres and broken suspensions. Ultimately less load also means less time spent packing and unpacking every day. You can enjoy more time wetting a line or relaxing with a frosty one clasped in your hand. Unsecured objects in your vehicle can slide from side to side, causing spillage, breakage or damage. An organiser, like Stayholds, can stop this from happening and keep everything tidy. Have a few of these on hand for different situations. You will always be ready for the next trip, no matter what your load is. MRT also has a range of draw modules and shelving modules to choose from. We discuss these in more detail below. As most of the cargo space is behind the rear axle in utes, it’s important to load the heavy stuff right up front of the tray. This allows for a better balance of weight for the vehicle. Employing this tactic on a regular basis assures you don’t overload the back and cause problems for your vehicle. This is one we obviously have a great deal of experience in. Utes generally have less storage volume than a 4wd but attach a canopy to the tray, and you instantly double it. Plus your gear will be more protected. We have a range of canopies for any job. Get fitted out with an MRT canopy and you’ll have the space you need to go for extended camping trips with all the accessories and tools necessary. This one is dependant on what kind of terrain you will be covering. Even if you’re packing to full capacity, it’s essential to carry water, even on a day trip, as you never know when you might get stuck. Bear in mind water requirements range from two to five litres per person per day. If you get in trouble those beers might taste good for the first few hours, but wont help in keeping you alive in the long run. Keep an esky full of beers as well as, not instead of, an ample water supply. If you really want to keep your beers cold, you can fit a chest or upright bar fridge/freezer. There are many camping fridges on the market, specifically designed for utes, that can be powered by either solar or a generator, depending on your campsite. At MRT we have a range of Fridge Slides to accommodate your fridge. Installing a set of drawers, shelves or a toolbox onto your canopy can make packing easier and save time on your daily repacking. Essential items such as tools, the stove, spares and recovery gear can be put away in the drawers and easily reached if required. This allows you to quickly swap between work and play as well. Simply empty the work drawers and chuck in all the goodies you’ll need for your camping trip. If you’re going off-road, then you’re likely to hit bumpy terrain and different angles which can make your gear shift around. A sliding load is dangerous as it can cause you to roll over or something might fly out and hit the back of your head. Make sure everything is locked up securely. Whether utilising toolboxes and drawers or having a looser load make sure everything is locked up and strapped down. Wherever you are heading keep these tips in mind when packing your canopy or trailer. We are looking forward to summer here at MRT so we can get out and put out canopies and toolboxes to the test against the great outdoors. If you need any help picking your next canopy or toolbox make sure to get in touch with our team.